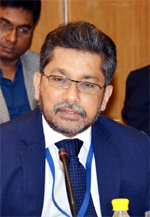 Saman Kelegama is the Executive Director of the Institute of Policy Studies of Sri Lanka (IPS). He is a Fellow of the National Academy of Sciences of Sri Lanka and was the President of the Sri Lanka Economic Association (SLEA) during 1999-2003. He has published extensively on Sri Lankan and regional economic issues in both local and international journals. His latest books are: Foreign Aid in South Asia: The Emerging Scenario (2012), Trade Liberalization and Poverty in South Asia (joint editor 2011), Migration, Remittances, and Development in South Asia (2011), Promoting Economic Cooperation in South Asia: Beyond SAFTA (2010), Trade in Services in South Asia: Opportunities and Risks of Liberalization (2009), South Asia in the WTO (2007), Development under Stress: Sri Lankan Economy in Transition (2006), Contemporary Economic Issues: Sri Lanka in the Global Context (2006), South Asia After the Quota System: The Impact of the MFA Phase-Out (2005), Economic Policy in Sri Lanka: Issues and Debates (2004), Ready-Made Garment Industry in Sri Lanka: Facing the Global Challenge (2004), and many more. He is the co-editor of the South Asia Economic Journal (Sage Publications) and serves as a referee for a number of international journals. He serves and had served in a number of government and private sector Boards as an independent member. He received his Doctorate (D.Phil.) and Masters in Economics from University of Oxford, U.K. Masters in Mathematics from the Indian Institute of Technology, Kanpur, India.